Jimmy Kimmel Receives 2016 Emmy Nomination for Outstanding Varity Talk Series | Jimmy Kimmel Live! 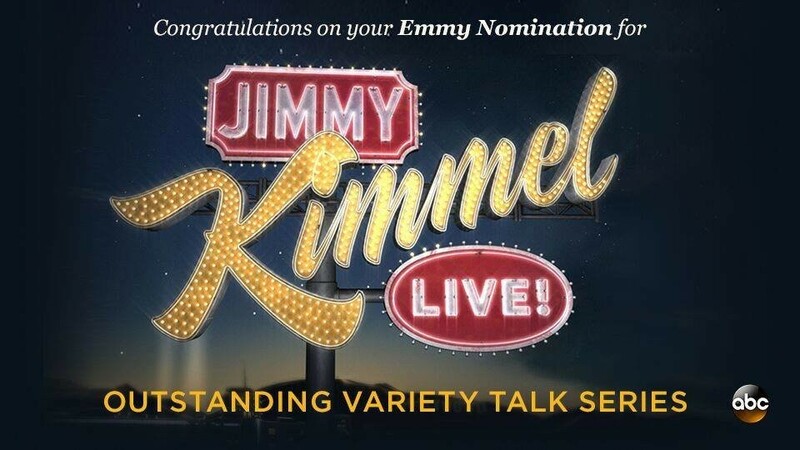 Congratulations to Jimmy Kimmel Live for its 2016 Emmy nomination for Outstanding Variety Talk Series. This is the sixth Emmy Nomination for Jimmy Kimmel Live. Jimmy Kimmel will return as the host of the 2016 Emmy Awards that airs on Sunday September 18th. Jimmy Kimmel Live features a diverse lineup of guests that include celebrities, athletes, musical acts, comedians and human interest subjects, along with comedy bits and a house band. When asked about returning as the host Jimmy stated, "I am excited to be hosting the Emmys again. I have a feeling I'm going to be great."